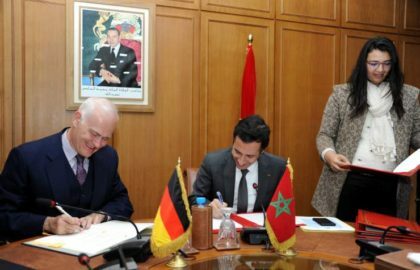 Germany is supporting Morocco’s sustainable development efforts with a financial assistance of €330.5 million, including loans and grants. The funds will help the North African country carry out projects in renewable energy, electric power, water supply & storage in rural areas and desalination of seawater. Two agreements were signed in this regard by Moroccan minister of Economy & Finance Mohamed Benchaaboun and German ambassador in Rabat, Götz Schmidt-Bremme. These agreements show the excellent ties existing between Rabat and Berlin, said Benchaaboun, noting that Morocco is a major partner of the German initiative “Compact with Africa” (CWA), which seeks to promote private investment in Africa and increase attractiveness of private investment through substantial improvements of the macro, business and financing frameworks. The CWA initiative brings together reformer African countries, international organizations and bilateral partners from G20 and beyond. The initiative is meant to coordinate country-specific reform agendas, support respective policy measures and advertise investment opportunities to private investors. For his part, the German ambassador in Rabat said the signing of the two financial agreements enhances Moroccan-German strategic partnership and supports cooperation between the two countries in the fields of renewable energy, water and sustainable economy.